It's fun! It's easy! And it's very safe. Now you can join millions before you who have discovered the splendor of the Underwater World. Our experienced, professional staff can lead you into this exciting new world where you can swim with a dolphin, pet a sea lion, or ride a manta ray. Our Basic Openwater SCUBA Diver Course is designed with you, the non-diver, in mind. We start with the fundamentals: teaching you proper snorkeling skills. This is the basis for many of your SCUBA diving skills. 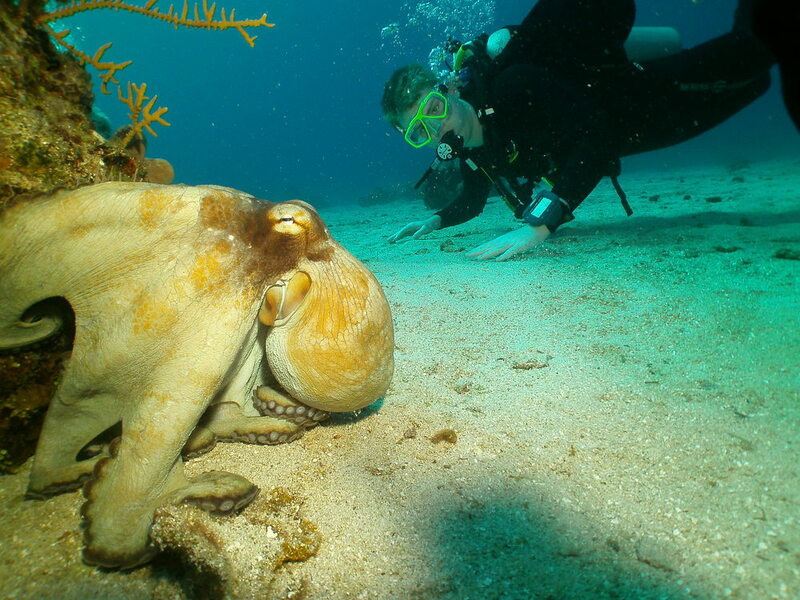 Even if you are an experienced snorkeler, you will learn valuable techniques that you will assist you in becoming a skilled diver. Our courses are conducted in many different formats for your convenience. We offer both online instruction and the traditional classroom environments to ensure you get the best training available. In addition to our regularly scheduled courses, Underwater World also offers condensed weekend courses and private instruction, allowing you to negotiate your busy schedule. With 15 highly experienced Instructors and over 12 different pool locations, you are sure to find a course that is perfect for you. This course will cover such topics as equipment, diving physics and physiology (How do I keep my ears from hurting when I go deep? ), dive planning, dive safety, avoiding the bends, marine life and environment (Should I be afraid of sharks?). In the pool we will teach you snorkeling skills, proper fin kicks, clearing water from your mask, snorkel or regulator, proper ascent and descent techniques, and buoyancy control. Then you will be ready to leave the pool and go to open water! After your course is complete you will be ready for your openwater certification dives. These dives are conducted locally, at Dutch Springs Lake, or can be done on a trip to the islands (See our travel section). Your openwater dives are done fully escorted and supervised by our staff. During these dives you will perform some of the same skills that you learned in the pool. You will experience slightly greater depths, put dive planning into practice, see some fish, and have a great time. The best part is that it can cost less than one month's payment on your car or a week worth of ski lift tickets. The cost varies slightly with each facility for whom we teach, so give us a call or check out a specific course for details. For planning purposes, you can figure on about $375 for the course, including the NAUI eLearning program, digital Certification Card and a plastic Certification Card. Divers may upgrade to the Premier eLearning program, which includes a logbook, dive tables, and a hardcopy of the book, for an additional $50. If you choose to do your certification dives with us, the fee is $275.00. This includes all the equipment that you need and a free surface marker buoy ($25 value). Want to do the Certification Dives for FREE? Students that purchase qualifying life-support packages before their first Certification Dives will receive their Certification Dives for FREE! Taking the course with the family? We have a family discount for that! Each additional family member will receive a $50 discount! This discount even applies if you upgrade to the Premier eLearning! At Underwater World, you won't find any hidden fees or surprise pricing. You can learn to dive for as little as $650 and additional family members for only $600! More importantly than anything else is the quality of the training. At Underwater World you will receive 10 pool sessions! That is more than double the time in the pool of any SCUBA Center in the region! That is why over 15,000 divers have chosen Underwater World for their SCUBA training. With eANX being so popular, Underwater World has developed a program that allows you to complete both your Scuba Diver course and your Nitrox course at the same time! Not only is this a great way to complete 2 courses, it saves your $75 when compared to doing them separately. The cost of the Dual Certification Course is $495*, including both the Scuba Diver and Nitrox Diver eLearning Courses, both digital Certification Cards, and both plastic Certification cards. We also have great family discounts for this program! Additional family members may complete the Dual Certification for only $400! That's equivalent to receiving a $195 course of only $25! Selecting Dual Certification MUST be done when registering for the Scuba Diver course. Speak with a Sales Team Member for more information. Take a look at our Basic SCUBA Courses! Your SCUBA Training doesn't need to end with the Basic SCUBA Course, in fact, it shouldn't. To get the most out of your new hobby you should plan to continue your training. Underwater World offers may different types of NAUI Continuing Education courses that can take you all the way up to becoming an Instructor! For more information and to sign up contact us today!